French Emblems: Emblem: Venter, pluma, Venus laudemfugienda sequenti. The belly; a feather bed; lust; one who seeks praise should run from these things. Famous Glory! Where are you rushing in flight, who is this man you are leaving that has driven you away? - I am fleeing from the man that lounges on soft down; and the accomplice of Venus; And the slave of gluttony. ora loquuntur, in eundem omnium coniecti sunt oculi. There are three mortal enemies to true glory and all things honourable: three deadly scourges, Idleness, Gluttony, Lust. These really are those seductive Sirens, to whom Ulysses, the past master of wisdom,† stopped his ears; they are the very Gorgons that bring inertia to the mind and the will to work; they are the very same Harpies that embezzle the soul’s sustenance, who, that is to say, eat away at the inherited goods of the mind, despoil one of one’s senses, and dim the light of the soul. 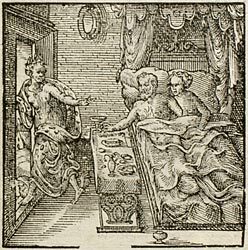 A man like Sardanapalus or some sort of Bonosus should be depicted, fat and overweight, lying recumbent on a bed, propped up on arm-rest cushions, laying his right hand on a dish [or wine-bowl] on an adjacent table, and with his left fondling the bare-breasted Venus. To the side should be added Glory, who should appear as if taking flight, looking over her shoulder, and as if making a sign of farewell with her hand turned away. Glory’s dress, moreover, should be portrayed, as purple, being visible from afar off, or woven with gold in the Attalian manner, and with a laurel crown as a witness to her immortality. On her feet I would add ankle-wings, like those of Mercury: and I would make that purple or gold-shot cloak distinctive by showing tongues and eyes scattered all over it: the first because glory spreads abroad all around the [p.144] world; and the other because the mouths of all men speak of a man who is famous for glory, and the eyes of all are upon him. * As in emblem XXVI ([FJUb026]). † Adumbrator: the meaning is not immediately clear (the word itself does not appear in Lewis & Short). One possible meaning is that Ulysses gives us a shadowy semblance of wisdom; another meaning of adumbro, however, is to finish a painting by putting in the details of the shading. 1. The prose explains that there are three ‘deadly scourges’ inimical to a life of praise and honour: laziness, gluttony and lust. 2. Ashurbanipal (aka Sardanapal), 7th-century BC king of Assyria. 3. Bonosus: a minor and short-lived third-century emperor, of whom the Augustan History relates that he was capable of drinking prodigious quantities of wine. 4. Subalaribus culcitris: a curious and obscure reference to a phrase in Lampridius’ Life of Elagabalus (in the Augustan History); Elagabalus was of course a byword for decadent living. Subalaris means something that fits under the arms; culcitra is a misspelling for culcita, a stuffed cushion or pillow. 5. The phenomenally wealthy Attalus III, King of Pergamum, discovered the art of weaving cloth with gold.